Walmart is the PUP that uses misleading techniques to prevent removal. Use Reimage to locate malicious components and get rid of them faster than with uninstall instructions. A full system scan blocks virus reappearance and prevents traffic to malicious domains. Walmart virus is a dubious application that is promoted via Pokki – a pre-installed program that is known to display countless advertisements and disturb users' web browsing sessions. While it is not considered to be malware, improper distribution techniques, and difficulties while trying to eliminate the app have raised numerous discussions. 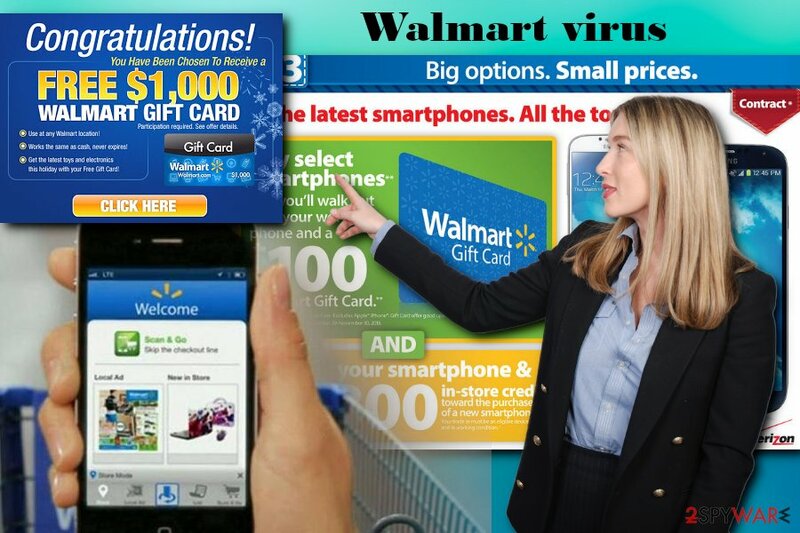 Walmart virus can cause $1000 Walmart Gift Card Winner and similar intrusive ads that are displayed on Google Chrome, Internet Explorer, Mozilla Firefox or other browsers. Users should also note that such viruses tend to gather rather a large amount of personal information about their victims to make use of targeted advertisement. However, there is also a chance that this data can be used for illegal purpose. 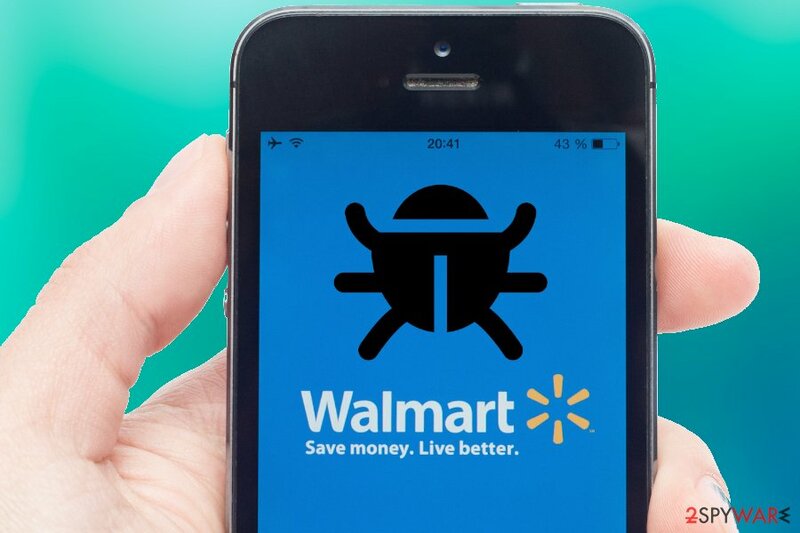 The main reason why app's users are calling it Walmart virus is due to the fact that it is difficult to get rid of. Even if users perform usual deletion steps (as they would normally do for other programs), that app will simply not go away and keep displaying intrusive ads. Thus, experts advise using advanced steps or install security software (like Reimage) to be able to stop the suspicious activity. Not many users enjoy intrusive advertisement, like pop-ups, pop-unders, in-text links, banners, coupons, deals and similar ads drive even the most patient people mad. What is worse, the Walmart virus displays sponsored content even on pages that usually do not provide advertisements. Consequently, users might be enlisted into sponsors mailing lists, receive calls from telesales advisors, and similar disturbances might occur more often than one might want to. For that reason, we suggest you take care of Walmart virus removal right now. Please check the bottom section for details. Just like many other potentially unwanted programs, this one also mostly relies on software bundling for its distribution. The marketing technique is prevalent in PUP distribution, mainly because it is incredibly effective. Distributors are well aware that users are not that aware of bundling, and often skip steps during the installation of new software or its updates. Therefore, they insert optional installs into installation wizards and prompt users to select Recommended or Quick mode, so that users would skip the vital steps that would allow them to get rid of the unwanted apps. To avoid such trickery, users should never run the installation of freeware and shareware (even legitimate programs distribute bloatware) and never skip steps. Most importantly, users should pick Advanced or Custom installation options to be able to get rid of all sneaky programs hidden inside. Finally, those who might want to download the app directly – we advise you not to. While it might seem useful at first glance when it comes to shopping, its negative effects should not be forgotten, and they often outweigh the benefits. If you are not that computer-savvy person, we advise you remove Walmart virus automatically by downloading and installing security software. We suggest picking one of the apps from the list below. Not only will save a lot of time but will also prevent you from tampering with computer files. Here, look for Walmart or any other recently installed suspicious programs. Wait until you see Applications folder and look for Walmart or any other suspicious programs on it. Now right click on every of such entries and select Move to Trash. When in the new window, check Delete personal settings and select Reset again to complete Walmart removal. Once these steps are finished, Walmart should be removed from your Microsoft Edge browser. Here, select Walmart and other questionable plugins. Click Remove to delete these entries. Now you will see Reset Firefox to its default state message with Reset Firefox button. Click this button for several times and complete Walmart removal. Here, select Walmart and other malicious plugins and select trash icon to delete these entries. Click Reset to confirm this action and complete Walmart removal. Here, select Extensions and look for Walmart or other suspicious entries. Click on the Uninstall button to get rid each of them. Now you will see a detailed dialog window filled with reset options. All of those options are usually checked, but you can specify which of them you want to reset. Click the Reset button to complete Walmart removal process. ^ What is personal data?. European Commission. Official website. ^ BedyNet. BedyNet. Cybersecurity articles. ^ Ransomware. Wikipedia. The Free Encyclopedia. This entry was posted on 2018-08-13 at 01:38 and is filed under Adware, Viruses. You can quickly scan the QR code with your mobile device and have Walmart virus manual removal instructions right in your pocket. How did you remove Walmart virus?